Portrait of Lieutenant General Ulysses S. Grant in full uniform, ca. 1864-1865. Grant was commissioned Lieutenant General by Abraham Lincoln in March 1864	and soon after appointed General in Chief of the United	States Army. Portraits of famous generals were mass produced and popular with collectors. The Wilderness Campaign of 1864 was one of the most violent and deadly of the American Civil War. To end the war, Grant repeatedly attacked during the summer of 1864. His first campaign against Lee's Army of Northern Virginia became known as the Wilderness Campaign. Grant's Army of the Potomac, numbering approximately 120,000 men, advanced across the Rapidan River into a place in Virginia known as the Wilderness. It was called the Wilderness due to the large number of trees and dense ground cover in the area. Lee met Grant's army, in the Battle of the Wilderness on May 5 and 6, 1864. Despite having just one-half the number of men that the North had available for the battle, the Confederates succeeded in blunting the Union advance. 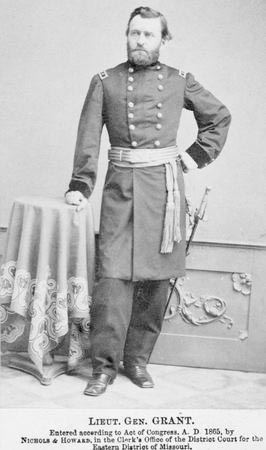 Unlike other Union commanders before him, Grant refused to retreat. He ordered his men to flank Lee's army and advance to Spotsylvania Courthouse. The Army of Northern Virginia managed to intercept Grant's force, and the Battle of Spotsylvania Courthouse lasted from May 8 to May 19, 1864. Again, Lee's men stopped Grant's army. Grant, however, continued to advance, meeting Lee's men at the Battle of Cold Harbor on June 3, 1864. In a little over one hour, the Northern Army suffered seven thousand casualties. The Battle of Cold Harbor marked the end of Grant's campaign to defeat the South easily. During the month or so of fighting, the North suffered almost sixty thousand casualties to the South's twenty thousand. Despite the tremendous difference in the numbers of men killed and wounded, Grant had a large supply of troops in reserve, and the North was able to recover from these high losses.